If your idea of animation involves Saturday morning cartoon shows, welcome to the world of animated marketing videos! Fast-paced, informative and fascinating, these brief productions are seemingly everywhere online – from websites to social media posts and inbound marketing campaigns. They don’t require a camera crew and cast, and provide higher quality than video taken with a mobile phone. We take a look at their increasing popularity among target audience members and marketers alike in driving traffic to websites and boosting conversion rates. This is the time to refresh memories on the power of animated video (and video in general) to tell your brand story and drive traffic more effectively. As Olga Bedrina points out for Dreamgrow, 65 percent of people are visual learners, and 90 percent of the information transmitted to the brain is visual. Not only that, visual information is processed 60,000 times faster than text. Bedrina also invokes the picture superiority effect, in which pictures and images are more likely to be remembered than words. With this in mind, animated videos for social media posts, websites and inbound marketing campaigns significantly level the playing field for small to medium-size businesses. According to Animoto’s consumer survey, 32 percent of consumers checked out a brand’s presence on social media before their website. Why are consumers doing so? It makes sense, says Hsiao. People are more likely to be engaged with their favorite social platform when they see a brand’s video – and also consider the information on the social post more up-to-date than information on the home page of the brand’s website. While social posts featuring video are more common for business-to-consumer (B2C) brands than business-to-business (B2B), Hsiao reports that LinkedIn is changing the game with its native video. According to the button-down business networking platform, video content is shared 20 times more than other content formats in the LinkedIn feed. Also, LinkedIn video ads are generating view rates of close to 50 percent – creating a significant opportunity for B2B companies to reach potential clients. So what makes animated videos special? Animation captures viewer attention – People have a short attention span online, and will spend only so much time on a video. Because animation is often less likely to be recognized as a marketing instrument, viewers are more likely to pay attention to an animated video than a traditional ad. Animation simplifies complex topics and makes them entertaining – Unlike a live-action video, characters (and objects) can fly and perform other feats that would require a big budget if actors, on- or offsite locations, sets and scenery were involved. You can compress a complex process – such as manufacturing – to be readily understood by your audience. Animation works for any marketing need – Whether you need a product explainer video, infographic or product launch announcement, an animated video will fit the bill. Of the 50 best explainer videos collected by such industry leaders as HubSpot, Video Brewery and Switch Video, only seven are non-animated. All that being said, adding animated videos to your online marketing mix is not the Field of Dreams solution. The most common pitfall, according to video marketer Amir Bazrafshan, is the lack of a strategic approach. Which leads us to the winding path of the buyer’s journey. For no matter how informative and entertaining your animated video may be, the rules of content marketing still apply. As an article on the Curata blog reminds us, “… marketers should be very careful to identify their audience’s needs in order to hit the mark with the right video format.” How to determine those needs? Focus on the buyer’s journey – the entire process a customer goes through from the moment they become aware that they have a problem or need, to the moment they finally make a purchase. Using a specific video format according to the different stages of the buying process that addresses the potential customer’s informational needs at each stage can help make the sale. 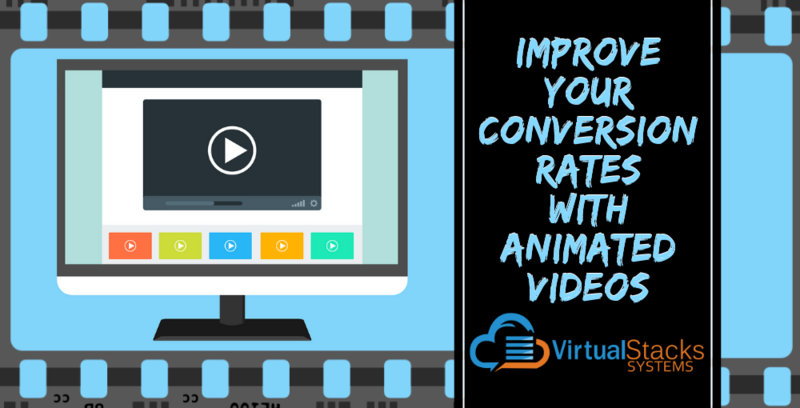 According to Deadline, animated videos have a higher click-through rate compared to text, resulting in a 70 percent boost in conversion rates, and are shared 12,000 times more than other content. Writing for Curatti, David Gutierrez notes that including a video in a landing page increases conversion rates by 80 percent. Awareness Stage – The consumer realizes he/she has a problem that needs to be solved. Effective types of animated videos can include educational videos and social media videos. Consideration Stage – The consumer has identified his/her need. Videos should educate them about solutions. Effective types of animated videos can include educational videos and how-to videos. Decision Stage – The consumer has decided to make a purchase, and is searching for the business that offers the best solution. An animated FAQ video can be effective at this stage. Animated videos can give your social media and inbound marketing campaigns a major boost. To get their maximum benefits, look for a digital marketing agency specializing in animated video production that can fit them seamlessly into your online marketing initiatives. Virtual Stacks Systems creates fast-paced, engaging animated videos that both inform and entertain. We provide one-stop solutions for local and global clients alike.